Like many Florida folks, Charlie and Peg Schmid moved from New Jersey a decade ago to enjoy the weather. I had the good fortune to meet them shortly after I landed in Florida, myself. Charlie has spent a lifetime getting to know mechanical systems in a way that really ought to grant him a PhD. He tells stories of working in machine shops, maintaining equipment in factories, and of course, building race cars and parts for people during his spare time. He accomplished things in the 60s and 70s that most of us haven't even figured out how to do today, like custom-build steel tube headers for people, based on flow calculations worked out with a friend at the physics university on a then state-of-the-art room sized computer system. Several of his stories seem to center on pulling a car out of the junkyard, tuning it up, and taking it to the track for a few runs. No matter what Charlie touches, it seems to go faster and last longer than anything anyone else builds. He laughs, "Just a junkyard motor in an old Pontiac! But we altered the rear suspension a little to make it hook up. No one could believe our 60 foot times." Charlie gave up running his own repair garage after getting disgusted that people weren't willing to pay what it takes to do a decent quality job. I understand his dilemma, especially after helping him put together the front suspension on his 66 Cuda, and marveling at the cleanliness and precision inside those front drum brakes. This guy does first rate work. I asked him about his love for the little 1965 Valiant. Turns out he's owned about 15 of 'em, both race cars and street cars. 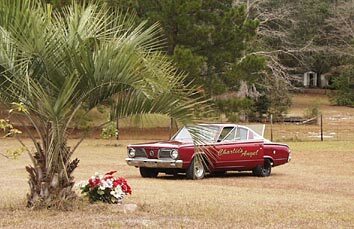 He took Peg's 65 Valiant to the drag strip in 1974, just to help a friend, and then decided to run the car. After getting laughed at for being the slowest car there, he vowed to see how fast he could make that little 170 slant 6 go. Ever since, it's been a series of experiments with fabricating lots of different parts combinations, including a turbocharger. Even as soon as a year later, he was running a half second under the Z/SA record. When he could not race as stock eliminator any longer, he turned his attention to making the fastest 170 powered street machine he could get. So far, his 2700 lb turbocharged 170 Valiant has run a 13.4 at 104 in the quarter mile! He grins, "It puts 5 liter Mustangs to shame!" There have been more than a few complications from tech inspectors with attitudes, or competitors who were tired of watching Charlie win. I asked him about one of his greatest comebacks: "It was somewhere around 1975. Went to a points race at Maple Grove, in PA. The previous year, stock eliminator allowed bucket seats from another car, as long as they were not lightweight seats. This year, NHRA said only stock seats allowed. 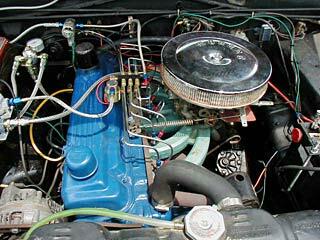 I still had Corvair buckets (got to read the rule book better). Failed tech. 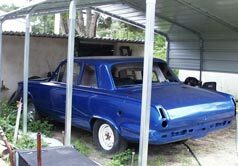 Where do you get a stock 65 Valiant seat on a Sunday? You get one from your 65 Valiant station wagon tow car. Quick seat change, back to tech, good to run." Ya think the tech guys were surprised to see him back that day? I'll bet! 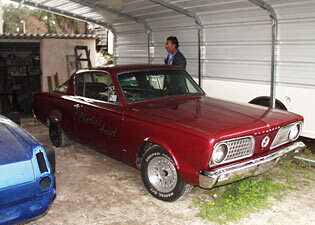 There have been lots and lots of Valiants, but the 66 Barracuda is his first. He built a new 360 to replace the existing motor with the cracked cylinder, but it's still sitting on his engine stand waiting. In the meantime, he couldn't resist putting in a little 170. This time he's trying out Nitrous Oxide. So far, that 3100 lb machine has run a best of 8.16 at 82mph in the 1/8 mile, and 13.43 at 96.9 in the 1/4. He recently finished up a few more electrical items and installed mufflers, and licensed it for the street. I was privileged to take a ride last time I went to visit. So how does a little tiny 170 with a warm cam, headers, a 2 Bbl carb and 3.91 gears move? Pretty darn well. The glasspack mufflers are a tad raspy at idle and downright loud when the pedal hits the floor. Despite a serious cubic inch deficiency, it feels at least as strong as any 225 I've driven, probably a little more. I smiled my approval. Then he reached down among all the racing gauges and flicked a switch, and a little red light turned on. I raised a quizzical eyebrow. "Oh, that's just the arming for the nitrous bottle. Watch this!" At probably 2500 rpm or so, he mashed the pedal. Lemme tell ya, feed that puppy some laughing gas and it flat out honks. It's a good thing he limited his showing off to high gear (the pavement was wet, so we didn't have much choice). In first gear, I suspect most of my internal bodily organs would have been rearranged... I suddenly realized why that car really needs high-back seats or headrests. Charlie, I hope you do that before you increase the Nitrous jets, OK? I should have known that when anyone says "Watch This!" you know you're in trouble. I popped the hood when we got back, to make sure it really was only a slant 6 under there. Wow. What's next for Charlie? "My goal is to run 12.00 with a 170 engine in a street car. That would be easier using a 225 engine, but I like to be different. Very few people use the 170 engine." 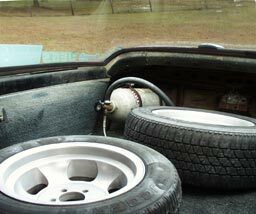 He's looking forward to finishing the bodywork on the Valiant, so he can try installing a 170 with both turbo and nitrous at the same time. Think that'll do the trick? Knowing Charlie, he'll find a way to pull it off.